Cell padding spaces are spaces between cell inner borders and cell content. By default, browsers give cell padding spaces of 1 pixel. <table cellpadding="1"> - Sets cell padding spaces to 1 pixel. <table> - Sets cell padding spaces to 1 pixel. <table cellpadding="0"> - Turns off cell padding spaces. 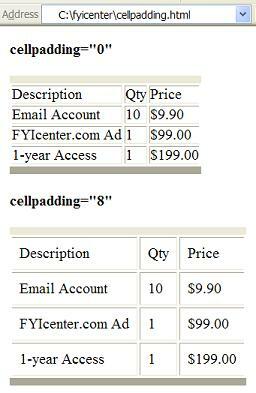 <table cellpadding="8"> - Sets cell padding spaces to 8 pixelx.